Pledging Allegiance | "Northern Crossings"
We recently did the Pledge of Allegiance to the flag of the United States of America a funeral in church, and immediately after the pledge I lead the Pledge of Allegiance to the Christian flag. There was a lot of pledging going on that day and we should have had a pledge for stewardship as well but I left that out since it was a funeral. It was a little bit surprising that halfway through the Pledge of Allegiance to the Christian flag I was basically speaking alone. Many people afterwards said they never heard of the Christian flag and didn’t know that it had a pledge. I was a little bit surprised by that but I guess I shouldn’t be surprised by much of anything anymore. I learned the Pledge of Allegiance to the Christian flag way back when I went to Vacation Bible school. I love to tell the story that when we had Vacation Bible school the first time I went we were allowed (gasp) to use the public school building. We went for two weeks straight five days a week, eight hours a day (gasp). We made really cool art projects, stuff that still hangs on my mothers wall and real baskets that really work 50 years later. There’s a lot of stuff you can memorize if you’re there eight hours a day for 10 days. One of them was the Pledge of Allegiance to the Christian flag. Not long after I started going to Vacation Bible school it was changed to half days for 10 days. Monday through Friday but only half days for two weeks. A couple of years went by and some bright bulbs out there figured out that that was kind of stupid. Why not just have eight hours a day five days a week and you to complete the same purpose. A couple more years went by and some bright bulb says why don’t we just have a half days for five days a week. That would save on a lot of food, and wear and tear on teachers nerves. And it wasn’t much longer after that that we started having it for two days a week, then for three hours two nights a week, and now most of us are lucky if we have it for a half day or if we have it at all. I don’t like talking about things like this because it makes me sound like one more crotchety curmudgeon which I am anyway but bellyaching about the good old days doesn’t do anything to help the bad old days were in right now. But learning the Pledge of Allegiance to the Christian flag might be helpful. 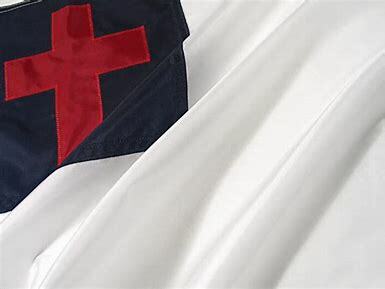 If you haven’t seen a Christian flag the above is the faithful representation of the one we have in our church. And the pledge goes like this – “I pledge allegiance to the cross of my Lord Jesus Christ and to the faith for which it stands. One Savior, King eternal with mercy and grace for all, so help me God”. It shouldn’t take eight hours of memorizing for 10 days to figure it out. Kids can probably pick that up pretty quickly if you put it on an iPad, and just have it repeated on some kind of a video loop. Maybe we should put on YouTube. There are different versions, but that is the one I learned. NextLittle House on the Prairie? Say It Ain’t So!